PCS: All for one, one for all...except for drummer, ngoma girl. Arrrgh, Isla is standing near! Evil fate of all drummers: nobody likes Ringo/ Lita/ Isla :(. 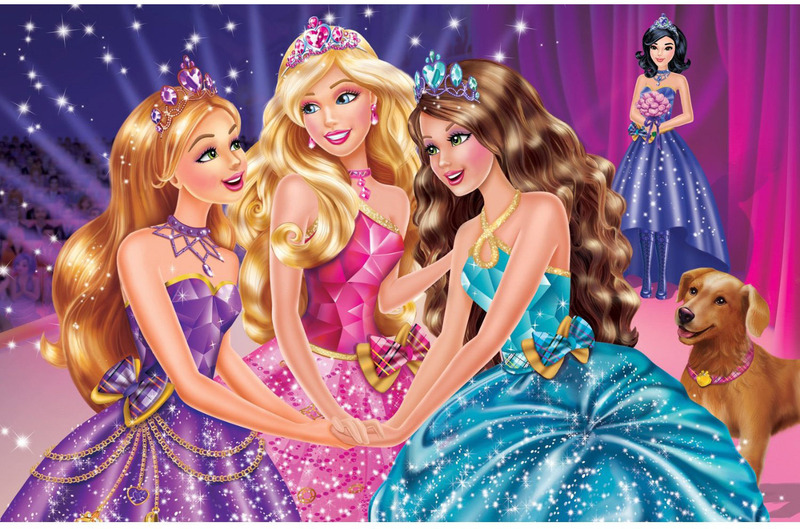 HD Wallpaper and background images in the Sinema za Barbie club tagged: barbie princess charm school blair hadley delancy isla. Well, Isla has been in almost every picture of the book along with Blair and Hadley, so I think it's time for Delancy. I know I'm biased cause I like her. Don't worry guys. From what we've seen, I think she'll have even more screen time than Delancy. Oh, and the dog... Well, I'm glad Mattel didn't make another Sequin. She was annoying. Yeah, she probably will get plenty of screentime, but the whole exclusion of her just seems very strange. Plus, in spite of everything, she's growing on me. Lolz. Actually, Isla was added in last moment; maybe, she was cloned from Tessa's sketches. Lol! Sequin was totally annoying, and it's first time to see male dog (from Midas of P&P, thanks to my sis' Lyss for reminding). It seems this thingie, which sparkling fairy lad means by saying jewel, is catch material in movie, like that pattern on Blair's skirt, which name I forgot. And their hairs are pretty perfect. But I'm still afraid because of Isla. She stays there so calmly, that I'm trying to think: "Nobody likes Isla, nobody likes me, all drummers are forever back". But, remembering Ringo, I and Isla understand, that it's not true. Come on, Isla, everybody likes drummers! Let her have this hairstyle. 'Cause playing drums with long hairs is freaking hard, I could approve. Nah, I'll leave you alive. CORINNE, VIVECA AND ARAMINA, BUT WHERE'S RENEE? LOL! And that Isla was such a pretty one, but too bad she's in the back. And it's really stupid that drummer's are in the back, but in case of Loli's comment, yep, I agree. Rawr, Hadley is Renee! She's not Viveca, ok? LOLZ! I'm great and so are Ringo Starr, Bo Stelli and Isla *insert name here*. LOLZ BR! Doggie-woggie. LMFAO. And OMK! It's lad dog! His name is Prince, OMK you BR! Okay, I have to say it; how many of you have heard of the "FOREVER ALONE" meme on Tumblr? Because whenever I see this picture, it immediately pops into my head. LOLZ, I meet it every day while sitting on Google and on lurkmore.com! Lolz it's OMKellysh true, but Forever Alone face is a little beatle...ehm...can't imagine Isla as it, lol! Oh...I like Ringo and Lita *wink* I'm not sure if I like Isla yet. I have the feeling, though, that I'm going to pay a lot more attention to her than to the others. Evviva to Beatlesque pal of me! Hey, Ringo, somebody likes us both! Drummers are cool. Honestly. And I feel the same way about Isla. Yayay! My future userpic is glad because of you, birds! It's great! Isla is wonderful.But why she's standing on the back so quiet and alone? I wanted her together with all the other girls.She's a drummer and so what? All the drummers are talented.Wait.Lola finally,Hadley is Nikki? OMK Adri! It seems, that band is always together, and drummers are on their own. I can approve; Rinnie (this little smiling lad on me userpic) can approve a beatle. And so is Isla. Forever alone. It's bad. Absolutely. Too bad for us.I can't see the images.It says that it is forbidden. Strange thing. It's Katti's Dolls, and it's not forbidden. It says it's forbidden to me too! OMK!! And BTW, for me she's Teresa! And no one can say everything else! Kayla is an old character and she doesn't exist anymore! Barbie's best friends are Teresa, Summer and Nikki! LOL me!! Exactly Ceci! That's for me too. Lol Ceci, what's wrong with Kayla? I adore her facemold. What browser do you have, birds? Try to remove Fanpop's referer: fanpop.com, then go, fa-la. Strange thingie. It still doesn't work. Are you possibly referring to this image?